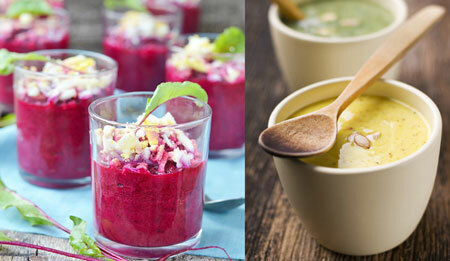 What to serve at the wedding reception? 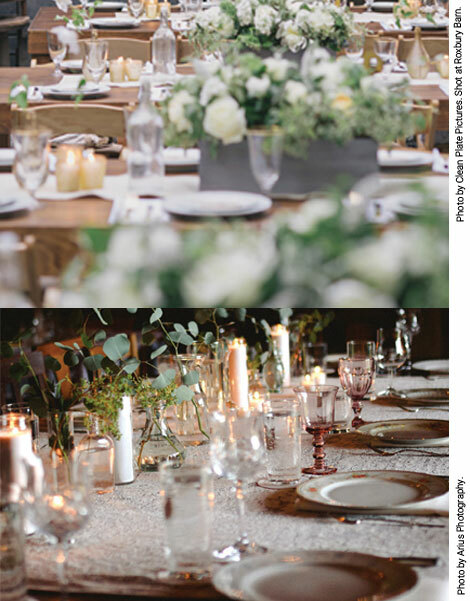 A few factors that will be taken into consideration are the number of people, your venue and location, your budget, and style of the event. Then, of course, you’ll want to share your excellent taste in contemporary fresh and local food with your guests. If you’re planning a Hudson Valley wedding, you’ll want to show off our abundance of locally grown foods, humanely raised meats, and the gourmet caterers, restaurants, and food trucks that supply them. We have all types of food to fit all types of weddings, from casual to elegant. If you’re planning a Hudson Valley wedding, you’ll want to show off our abundance of locally grown foods, humanely raised meats, and the gourmet caterers, restaurants, and food trucks that supply them. This is a versatile and delicious menu option that can be a huge hit for both casual and sit-down wedding receptions. For an outdoor daytime wedding, the pig can be roasted on the spit as a focal point of the festivities. For a more elegant affair, the meat can be served while the roasting and carving are off-site. To go with this theme, how about a stand with different flavored lemonades manned by a younger member of the family? It’s a great way to get the party started. Family style meals are the perfect middle ground between the plated meal option and the more casual buffet reception. Everyone is seated at the same time and digs into large shared platters of food placed on the tables. It instantly creates an intimate atmosphere and promotes conversation. Guests can help themselves to as much food as they like. Costs are generally estimated to be about the same as a buffet service, with the benefit of having food that is served freshly cooked, not overheated in buffet chafers. Another bonus: there is less time involved in serving the meal, leaving more time for toasts, cake, and dancing. Food bars take the buffet concept to new heights of creativity, both with regard to the food and the presentation. They are smaller food stations that feature delicious, customizable concoctions. You can decorate them to be as funky or luxurious as you like. A manned food bar might offer raw shellfish, perhaps with a chef shucking the oysters. The possibilities are endless: a build-your-own-taco bar, a mashed potato station with gourmet toppings, a delectable pizza bar. How about an olive oil tasting station with olives, artisanal bread, and dried fruit, or a cheese station using some of the finest local cheeses, paired with apples and prosciutto? Anything with toppings, sauces, condiments, and sides makes for a terrific food bar offering. Who doesn’t love to assemble their own edible creations? Food bars are a natural born fit for desserts and cocktails. How about a Mimosa bar with fresh fruits and a selection of organic juices, decorated in floral splendor? Cheers! Food trucks can be the perfect answer, not just to complement with desserts or late night snacks, but for the whole meal service. 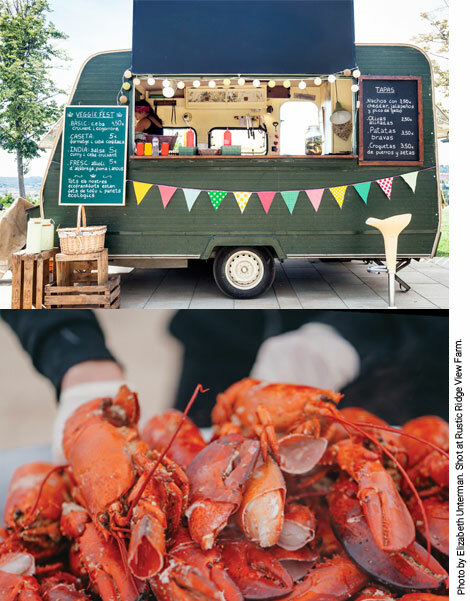 Food trucks can serve Korean BBQ, lobster, Caribbean food, crêpes, fish tacos, Polish food, Mediterranean food, Pan Asian food, noodles—virtually ANY kind of specialty food you can come up with. You may also opt for deluxe versions of comfort food, like several different types of grilled cheese sandwiches or mac and cheese. Even the classic pizza truck can be transformed into a gourmet kitchen, serving not only several kinds of unique twists on pizza, but also firing up a few other appetizers in that oven, like pear and blue cheese pastry triangles. Your ice cream truck can concoct alcohol-infused ice creams and sorbets. How about a whiskey vanilla bean cone or a fresh watermelon-mint-rum sorbet! They can offer non-dairy options for your vegan guests, as well. One benefit of the food truck is that it can drive right up to the venue if you are planning a reception in a remote area, such as in the mountains or on the water. No kitchen space necessary. What makes a great clambake? Lobsters, clams, chowder, maybe some BBQ chicken, sides of corn bread and delightful side dishes. It’s a great choice if you’re having a wedding near the water and if these foods can be sourced locally. Your guests will be able to eat what they want, as much as they want. Buffets can be less expensive than a plated meal, depending on the number of servers you won’t need, balanced with the extra food and equipment rentals that you will. There is nothing that says the food can’t be gourmet all the way. You can still offer your guests the most delicious and imaginative cuisine. A brunch wedding can be as festive or as casual as you like. The food can be on the simpler side, such as a fun cereal bar with a continental breakfast spread, along with some signature egg dishes. 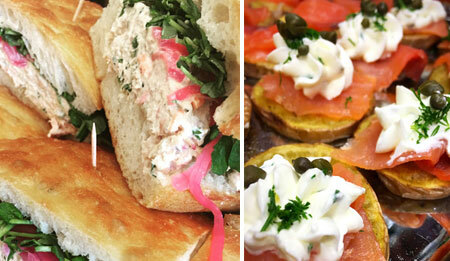 Or you can serve up gourmet frittatas and poached salmon. Smoked items are becoming more popular, not just salmon and sable, but tuna bacon and salmon bacon, smoked tuna, and smoked meats. The booze budget will be reduced because of the time of day, and your guests can still enjoy Bellinis, Bloody Marys and Tequila Sunrises. And don’t forget outstanding fresh brewed coffee and cappucinos! This is the most elegant choice if you are planning a seated meal. One advantage is that the speeches, dances, and cake-cutting can be accommodated more easily as the various courses are served to everyone at the same time. It may not even be more expensive—you are likely to save on food costs as the amounts of food can be more accurately estimated, unlike a buffet. 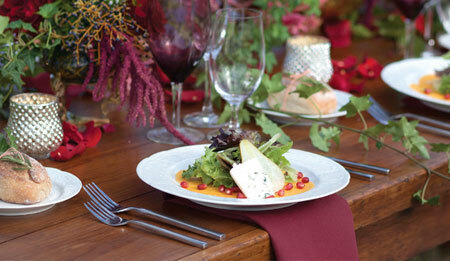 Typically, guests can choose from two or three entrées beforehand so that your caterer knows exactly how much to make. The official caterers of the Onteora Mountain House, Blue Mountain Bistro is committed to providing high-quality food catering service both on the day of your wedding and during the time leading up to your event. 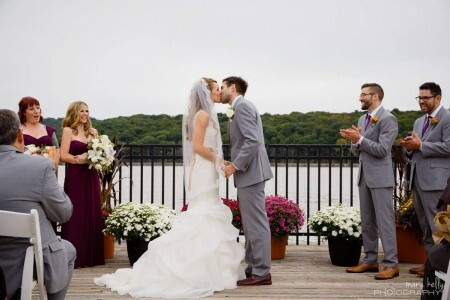 When you choose Blue Mountain Bistro Catering to cater your wedding in the Hudson Valley, you will be rewarded with raves from friends and family. Feel totally carefree to relax and enjoy yourselves knowing that their creative, experienced staff is handling all the details of the day. 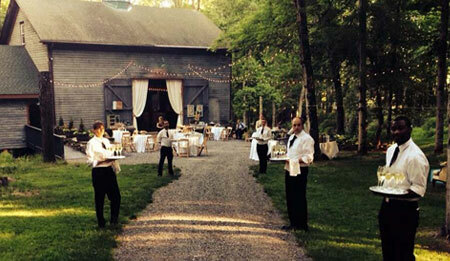 Bridge Creek Catering is an experienced off-site caterer that excels at executing special events. Their detailed planning and extensive experience allows them to provide handcrafted, restaurant-quality food for large groups in unique locations, and they specialize in crafting menus that celebrate their clients’ unique interests. Their chefs have deep and varied culinary backgrounds and can prepare anything from American and Argentinian to French and Filipino. Their detail-oriented staff will keep track of all the event needs during the planning process and provide day-of coordination with the officiant, florist, musicians, etc. Now the exclusive caterer at Senate Garage in Kingston. 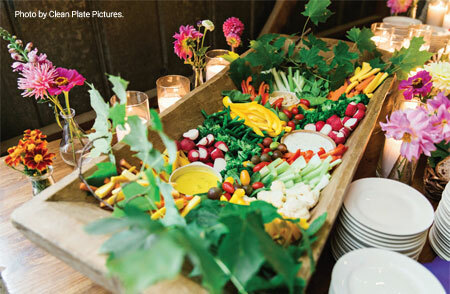 Farm-to-table wedding and event catering offers the freshest local fare in the Hudson Valley, something that is at the core of Cafe Mio’s food philosophy. They strive to provide an experience that allows the culinary wealth of the region to shine in every dish. 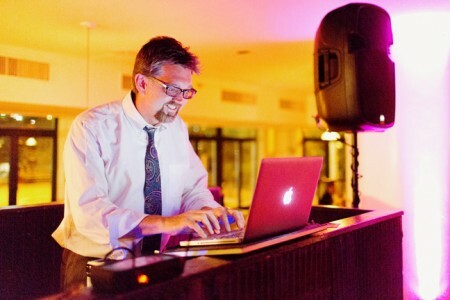 Cafe Mio will make your wedding an event everyone will remember. Cucina Woodstock & Market St.
Offering indoor and outdoor options at two locations. We will accommodate your event with every attention to detail; and can discuss menu choices based on budget, size and style of event. Both restaurants are available for a buyout or to cater at a location of your choice. The Barn at Cucina is a restored 19th-century barn with original beams, long rustic harvest tables, and splashes of modern décor. 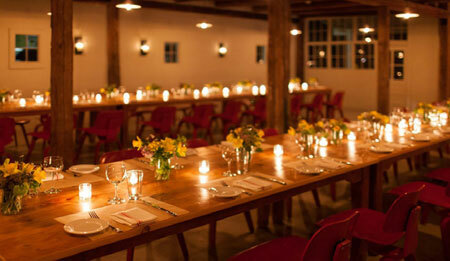 Accommodating up to 100 guests, the Barn is fitting for cocktail events, dinner parties, rehearsal dinners, and weddings. Fresh Company’s food combines the comfort and generosity of home cooking with the sophistication of restaurant cuisine. They are committed to sourcing seasonal ingredients from farms and producers in the Hudson Valley—not just because it’s right, but because it’s good. Look them up, and you’ll see “best food we’ve ever had at a wedding” is the most common review. 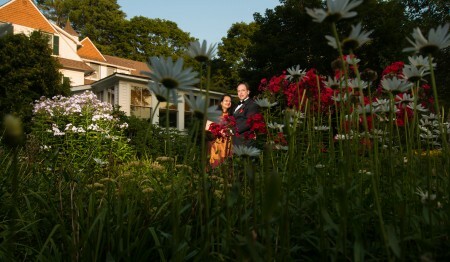 Fresh Company will help coordinate all aspects of your wedding to ensure your big day goes off without a hitch. 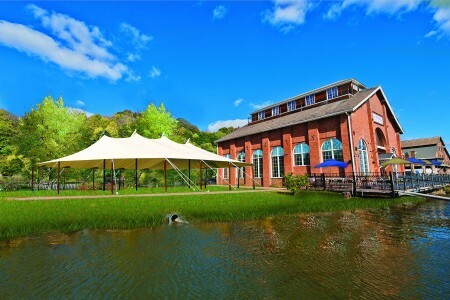 Frida's Bakery & Café, nestled in the apple orchard region of Marlboro on the Hudson River, offers beautiful bridal showers in the loft space, as well as after-wedding breakfasts and parties. In addition, Frida's can provide morning-of catering delivered straight to your door, and fantastic favors to make your special day extra special. 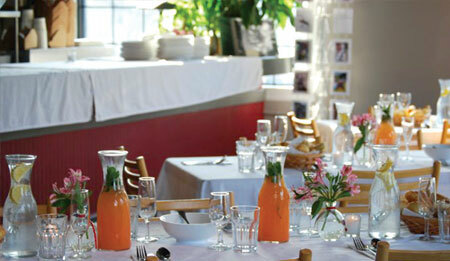 Frida's provides quality, service and hospitality with every event using fresh, local ingredients. 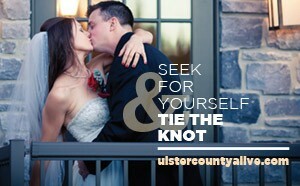 We’d love to be a part of making your wedding day extra memorable. 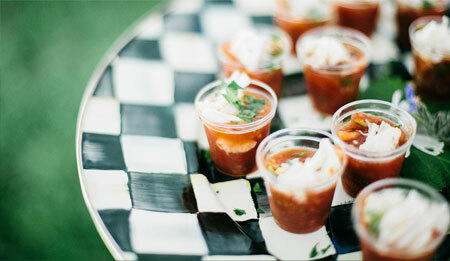 Graze specializes in seasonally influenced and locally inspired foods for weddings and special events of any style. Each of our events is individually crafted and can accommodate a range of visions and budgets. We offer the following services to make your event effortless, gorgeous, and delicious: customized menus; pre-event tastings; event design; coordination of rentals and staffing; and onsite set-up, plating, and breakdown. 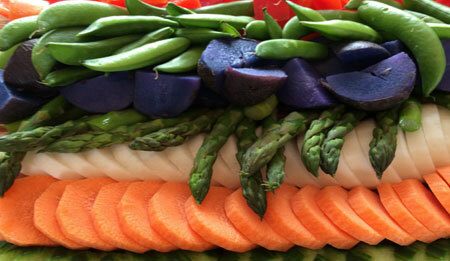 Grounded offers exceptional catering services for events of all sizes, specializing in wholesome food made from farm-fresh vegetables, eggs, and meats. Local farmers, fisherman, and ranchers who use the healthiest, most sustainable methods supply their ingredients. They can also assist with themes, decorations, invitations, and other event elements. They cater to all special-need palates and offer a diverse selection of vegan, vegetarian, gluten-free, and lactose-free menus. 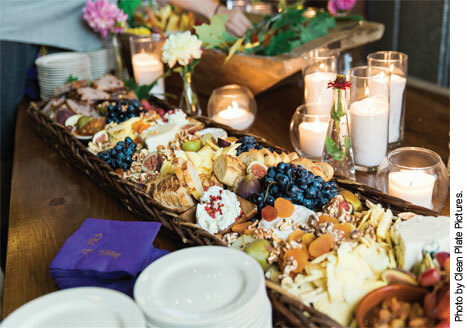 As a full-service caterer offering complete party planning, Hickory can provide trained servers, kitchen staff, and bartenders for a perfect wedding, including a selection of their most popular mouth-watering items. 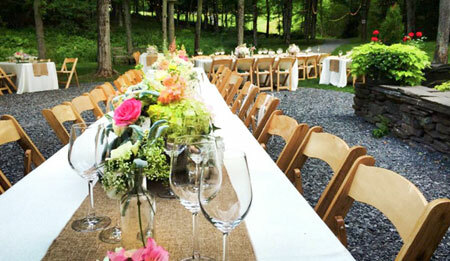 From a simple backyard barbecue to a special wedding, Hickory can help with all the details. 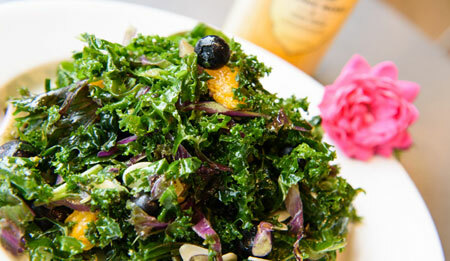 Many of their dishes are available as certified organic, grass-fed, vegetarian, and vegan—just ask. Linen and equipment rentals are available. 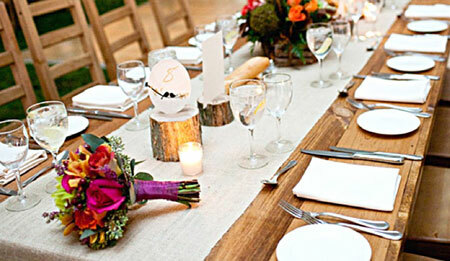 Likewise, they can also provide floral, cake, bar, and other services. 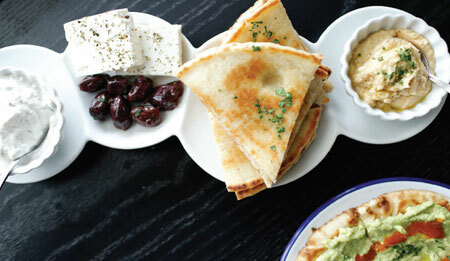 Kovo is a Greek-inspired casual restaurant with a focus on rotisserie meats and fresh, seasonal salads. Our food combines the healthy ingredients of my ancestors’ home on the Greek island of Samos and my home in the Hudson Valley. We are committed to serving the finest, freshest local produce and meat possible. 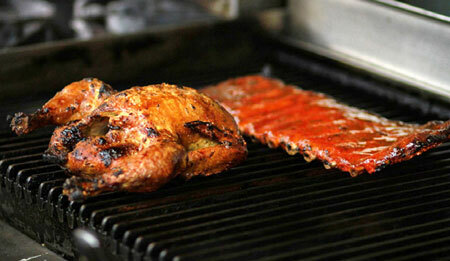 All of our meats are cooked in our rotisserie and supplied by regional farms. All of our salads are vegetarian and gluten-free, and can be made vegan. Committed to providing creative menus using fresh and sustainable ingredients along with personal and friendly service, Lekker has earned a reputation for consistent excellence, polished country fare, and sophisticated tastes that please every palette. Whether you’re hosting a reception for a few guests or a dinner for hundreds, they’ll be delighted to work with you to design a truly memorable experience using local, organic, seasonal, and sustainably grown ingredients. Main Course is a full-service caterer that can coordinate all wedding aspects including customized menus, decor, linens, and rentals. 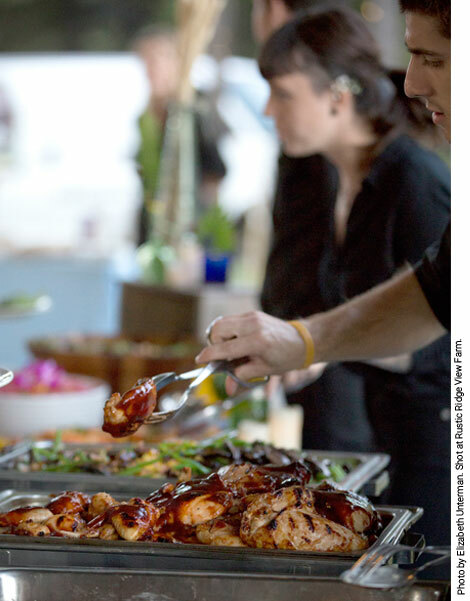 Under chef Bruce Kazan’s innovative leadership, a team of talented professionals creates the finest in catered events. 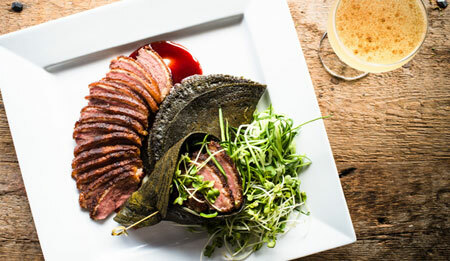 Main Course, a leader in the sustainable food movement, uses small Hudson Valley purveyors to provide the freshest local, organic produce, free-range poultry, line-caught fish, and hormone-free meats. 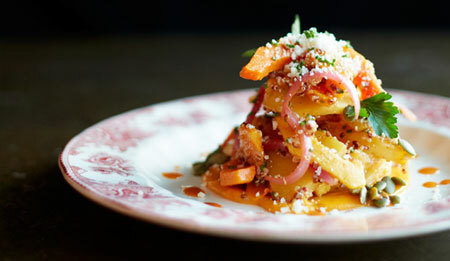 Miss Lucy’s Kitchen provides an inspired seasonal menu using fresh and local ingredients. 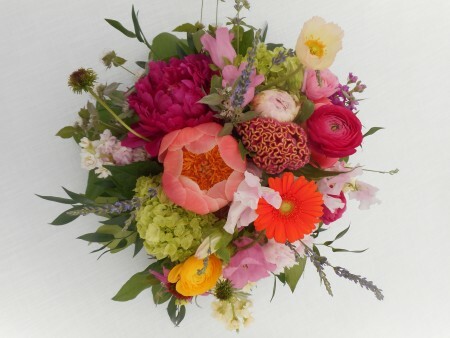 Whether you are having an elegant dinner party, country wedding, or family picnic, their professional staff can help to make your party stress-free. They will personally take care of and customize every aspect of your special event, including tents, tables, chairs, linens, glassware, plates, and more. Leave the details to them, so you can fully enjoy your party. 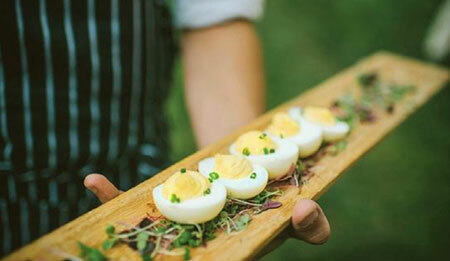 Provisions Kitchen & Catering provides custom catering menus for events and budgets of any size. With our fully equipped mobile kitchen we cater at ANY location, throughout the Hudson Valley, and beyond. 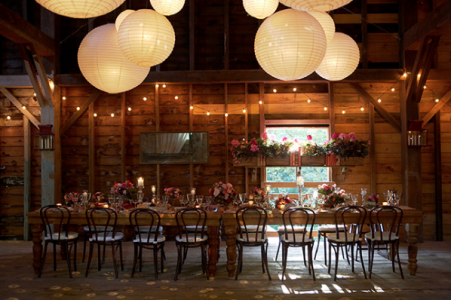 Whether a wedding in a barn for 300, a graduation BBQ, or an intimate farm-to-table dinner for 10. Sourcing all meat & produce as locally as possible, we do all of our own butchery, bake our own bread, and make our own cheese. Call today to plan your menu. 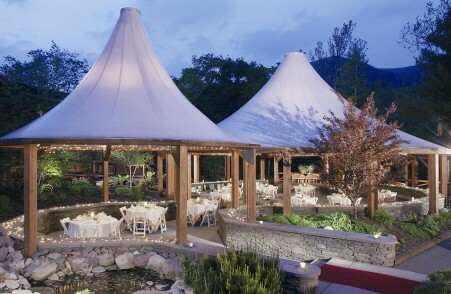 Redwood offers off-site catering, banquet room for 100, and a rooftop space with spectacular mountain and sunset views. Truly farm-to-table, we have a commitment to excellence using the highest quality ingredients and culinary creativity, combined with our professional, friendly service staff and stress-free event planning. 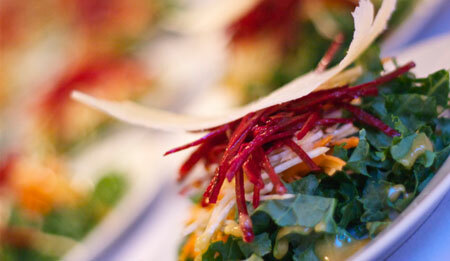 We offer custom created, flexible menus to accommodate any dietary needs. From seated dinners to casual luncheons, your meal will reflect your sense of style and be the perfect complement to your special day. Based out of the fashionable boutique Country Hotel, the Rhinecliff, we are premier caterers to the Catskills and the Hudson Valley. Full service, fully licensed, farm-to-table, craft beers, Maitre D’ service, all rentals included and our famous relaxed and attentive service. Full personalization, complimentary food samplings and the expert guidance of James, Lydia, Amy and Michelle. 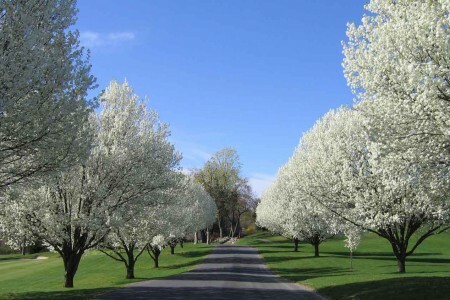 As a member of the Hudson Valley chapter of Slow Food USA, the TeaRoom’s mission is to offer high-quality local, seasonal, and organic food at reasonable prices. 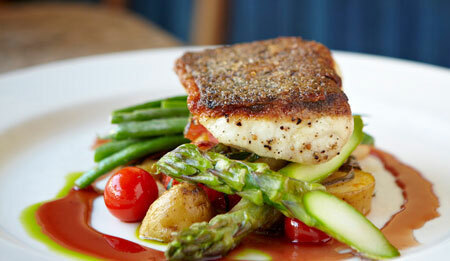 Their menus feature hearty dishes from a variety of European cooking traditions. Delicious food and attention to detail are the hallmarks of a catered event by The Village TeaRoom, Restaurant, & Bake Shop. Wm. Farmer & Sons are many things, but above all they’re excellent hosts. Everything they offer is beautifully curated and creates an atmosphere of modern upscale comfort. Taking care of people is what they do best. In the hotel or the restaurant, at their place or yours, Wm. 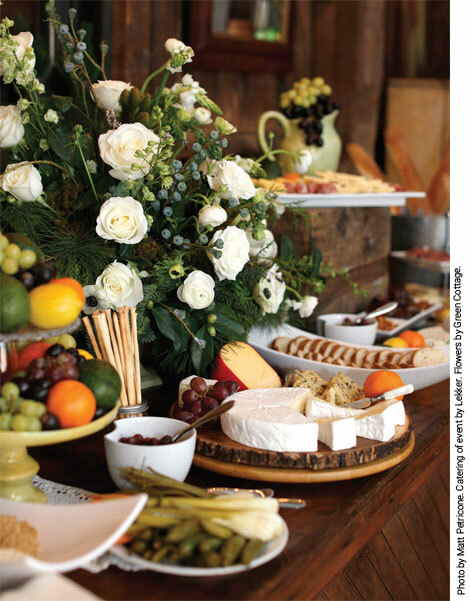 Farmer & Sons’ dedication to the craft of entertaining makes any occasion an effortless win. Contact them today to talk about hosting or catering your next event.